A thimble. Such a simple, useful, and un-amazing item in today’s world. But to anyone who does a lot of hand sewing, including embroidery, it can be a very important tool. There is nothing like shoving the eye end of a needle into your finger to remind you that you really should be using a thimble. But how long have thimbles been in use? And did they always look like they do today? Well, I would love to give you a simple answer to that first question, but the experts don’t seem to be able to agree on exactly how long thimbles have been in use. Part of the problem is that to accurately date a small item like a thimble, it really needs to be excavated from an undisturbed archaeological site. A significant percentage of the thimbles that are found are “occasional finds” – that means that they just show up on the surface or in a search with a metal detector. Add to that the fact that small bits of non-precious metal would not have been valued or studied by most early archaeologists, and we find ourselves with a lack of data. Later excavations have noted the presence of needles in graves, and we are seeing more and more interest, modernly in “domestic artifacts”. And that brings up another major issue. We don’t need thimbles unless we have needles. We know that needles, originally made of bone, date back at least to the time of the Denisovians (about 50,000 BC). Needles are a major breakthrough in the pre-human and human ability to produced clothing. By about 7,000 BC we see the development of copper needles in Armenia. And somewhere around 2,500 years ago bronze needles appear. 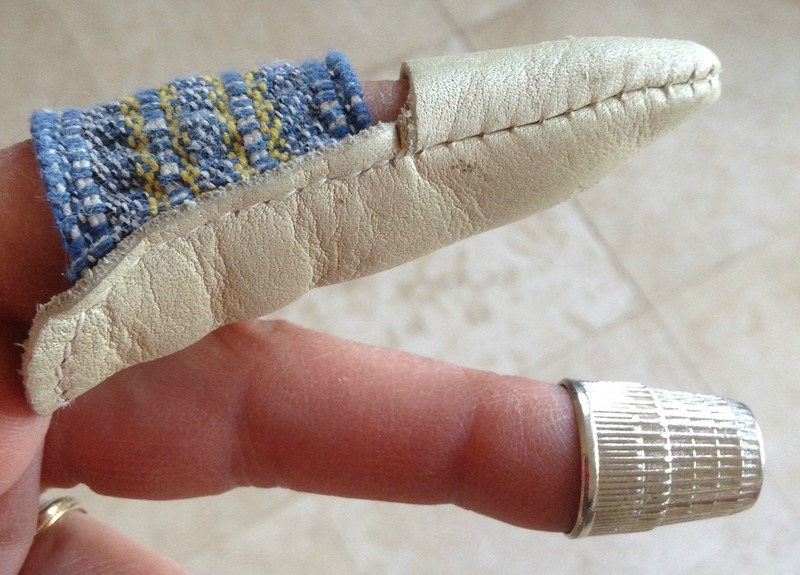 But do you need thimbles, or any other finger protectors for bone needles? Bone needles, and possibly even copper needles, probably relied on an awl to poke a hole in leather, and push aside threads so that a needle could slide through fabric easily. Now needles, being as small as they are, are very subject to corrosion by contact with acid soil. They are tiny and easily overlooked. I remember working on a Civil War era site in Texas when I was in grad school. We were excavating a trash pit behind a home. The excavation was done very carefully, using hand trowels. But we still washed a bunch of the dirt on window screens. And what did we find? Dozens of tiny pins and glass seed beads. Until that Texas clay was washed off you couldn’t tell a seed bead from a tiny pebble. I have read many archaeological reports that essentially stated “We would probably find a lot more tiny stuff if we screened the materials, but we don’t”. How much has been missed? How much has oxidized to dust? And how much has not been recognized for what it is? Here is a picture of some of my current modern arsenal of “finger protectors”. Next Time: But what sort of things do people make thimbles from? This entry was posted in Dress Accessories, Metal Casting, Metal Working, SCA Life, Thimbles and tagged Historical thimbles, Medieval Thimbles, Sewing, Thimbles by Eirny. Bookmark the permalink.